Our hearts will always belong to Greece. The country and people are some of the most gorgeous in Europe and they’ve been drawing in tourist for decades. The islands are filled with thousands of beautiful beaches, amazing food, and a rich history. Does this sound like something you want to be apart of? Well, the best part is it all comes at an affordable price. The warm Mediterranean Sea surrounds the country and the people are even warmer, we can’t tell you the number of times we were blown away by the hospitality of the Greeks. A lot of times we find the hype of a destination lets us down, but Greece is sure to not disappoint anyone. Most importantly for us full-time travelers, Greece is where we fell in love, and we’ll always have that to remember. Visa: Schengen visa. Which is 90 days in the European Union out of 180. Many nationalities are granted this on arrival for free. Check with your embassy to see if that is you. Weather: The weather in Greece is a Mediterranean climate. This means winters are mild and rainy, while summers are warm and dry with plenty of sunshine throughout the year. What to Pack: Warm weather clothes and a swimsuit, don’t forget a good pair of clothes to go and a jacket for cool nights. 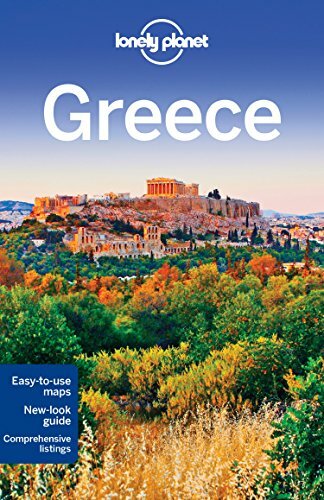 Read about what to wear in Greece. It all depends on where you are headed in Greece. In Athens and the less popular islands, it’s easy to find cheap accommodation and hostels, but islands like Santorini, Mykonos, and Ios fetch high prices in the summertime and require a reservation in advance. We love Greece because there are plenty of cheap apartments, hotels, and guesthouses that are often family run and can be found at an affordable price. We have traveled in Greece in high season and still managed to find rooms well under €50 a night. A lot of these rooms are also apartments that often have a small kitchenette with burner and fridge allowing us to cook meals and save money. The real draw of Greece is its many islands, so you can expect to take a lot of ferries and boats. Tickets between islands cost on average around €35 and €60 from Athens. If you’re taking short trips on the slower boats it’s possible to get a ticket for as low as €10. If you want to save a few Euros be sure to book a few months in advance, but most of the time you can book a ferry ticket the day before your scheduled departure. If it is an overnight ferry you will have to pay extra for a sleeper or be prepared to sleep on the floor. A number of the larger and more popular islands like Crete, Rhodes, and Corfu are served by budget air carriers. This is great and bad as it does bring a large influx of tourists to these destinations. Our advice takes the flight and then catch a ferry to a quieter island. These flights can be bought from central Europe for as low as €20 one way with Ryan Air and Easy Jet. Most islands have a small bus network and prices run around €2 a journey on average. While mainland Greece and Crete have long distance buses that cost anywhere from €8 – €20 between major cities. We love to cook while we’re in Greece as it’s a great way to save money. Greece is known for having amazing food and that all stems from the gorgeous food products. We eat plenty of pomegranates, olives, feta, tomatoes, seafood, and veggies while in Greece. Our favorite, of course, is a salad with olive oil, cucumbers, tomatoes, and feta. Fresh produce from the markets and grocery stores is cheap and you can easily be cooking your own healthy and delicious meals for €2-3 a meal. There are plenty of cheap places to eat in Greece as most restaurants are affordable already. You can pick up a Gyro for €2.50 – 4, we like to go halloumi in ours which the Greeks do perfectly. Also, in the summer be sure to have a frappe (€1.50) or freddo cappuccino (€2.50). There’s pretty much one type of dining experience in Greece that’s truly truly local and that is Meze. For a flat fee anywhere from €10 – €15 you’ll get all the specials of the day in small plates and they never seem to stop coming. Greeks will often go out for a full night of meze and ouzo on weekends. I suggest heading out to a local restaurant on a lively night too to see what the Greek food scene is all about. Ouzo is the drink of choice. It’s an anise-flavored alcohol that is mixed with water when consumed. The addition of water turns the alcohol to a milky cloud. Sitting high above Athens is the amazing Acropolis. It gives you a glimpse into Greeks long and amazing history. Visiting the Acropolis and the surrounding Greek ruins make for a great afternoon, just be prepared for big crowds. A ticket to the Acropolis costs €20. The largest Greek isle is also it’s most diverse. It has just about everything you go to Greece for – beaches, history, mountains, wine, and amazing food. We’ve spent a lot of time on Crete and would head back in a heartbeat. There aren’t a plethora of sights inland, but Meteora may be one of the most famous. It’s well known for the monastery that sits atop a massive cliff face. It is truly a stunning sight to see and at one point nearly 20 existed, now only six remain. Located on the island of Crete the Samaria Gorge is a spectacular place to go hiking. It’s widely considered one of the most beautiful national parks in Europe and stretches nearly 10 miles. There are plenty of places to go hiking and explore. It’s only the most famous island in Greece and for good reason. The towns along the island are gorgeous and sit atop cliffs created by a volcanic explosion thousands of years ago. The volcano is still active and you can often see smoke rising from the center of the circular island caldera. Amoudi Bay on Santorini is considered one of the best places in the world to eat the days catch. The bay is situated below the picturesque town of Oia and requires a long steep hike down a set of steps to a small deep water bay. Restaurants line the bay and local fisherman throw the days catch up to the dock before preparing and grilling over a fire. The Greek isle is well known for their hedonistic party atmosphere. Every summer, Europeans come here to party the night away only to sleep on the beach the next day and repeat. Even if you’re not big into parties the rest of the island is well known for being one of the most beautiful in Greece. Cruising the Mediterranean on a yacht is one of the most popular ways to see the Greek islands. It’s not just for the rich and famous either (trust us, we’ve done it and we are neither rich or famous). Every summer all walks of life head to Greece to bask in the sun from their own yacht or Turkish gulet. There are enough islands in Greece to explore and write about for a lifetime. 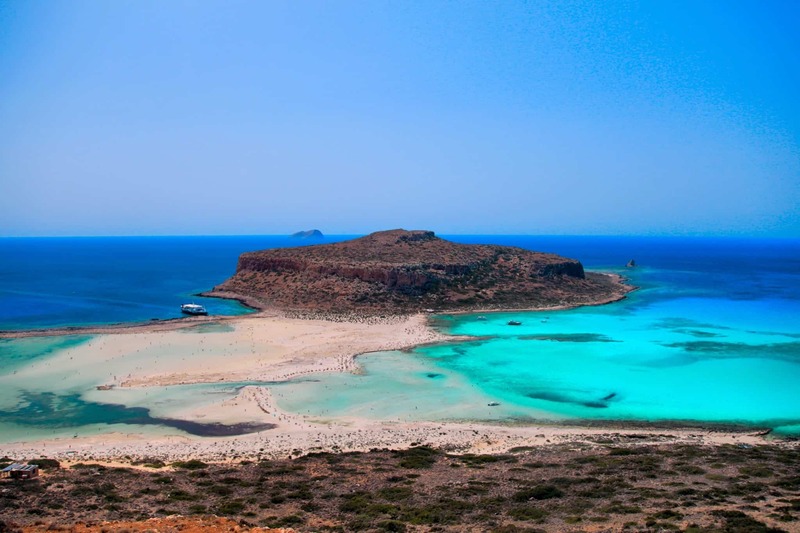 You can head to the popular islands of Crete, Corfu, Rhodes, or Santorini. Then you have smaller islands like Symi, Samos, Chios, or Kos where we’ve had fantastic experiences without hordes of tourists. There are many more beaches to get to so I suggest asking some Greeks when you’re there for their favorite beaches and head there!